The Blogger Labels gadget (Categories) only display the labels title/heading without listing the individual posts labeled with that label. Many are not happy with that. They wants the individual posts also listed under that label heading. There are 2 individual posts each (as of 13 December 2014) for these 2 labels - Sensors and Building from scratch. 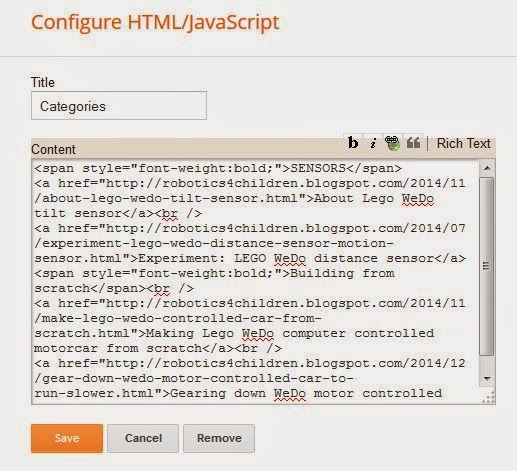 Type the title of of the first category (Sensors) and bold it by clicking on b. Add this HTML line break tag <"br> at the end to start a new line. Open those 2 label search pages (Sensors and Building from scratch) and note down the post titles and the permalinks (individual post URLs). Now for the first label/category which in our example is SENSORS. Type the text SENSORS and old it to make the category stands out. 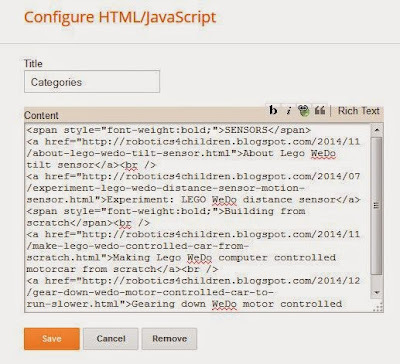 Add a HTML line break tag <br> to make the following text start on a new line. Then in the box, list down the titles of the posts with that label. Highlight a post title and click on the hyperlink icon . 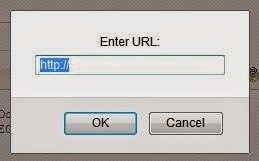 Just type or copy-paste the URL of the selected post into the URL field. Again type the line break code <br> at the end to start another new line. Repeat for the second post (and ad infinitum). Is there any way to add a category and transfer posts labelled for that category into a new one without having to go through each post and manually delete/change that label? Blogger have not provided a way and I do not know of any other way unfortunately.